When Maharashtra announced increasing the legal age from 21 to 25 for liquor yesterday, I could not help reflecting on my recent visit to Ristorante La Barrique, one of the three single Michelin Star Restaurants in Torino where not only are these ‘underage adults’ allowed to order wine with meals as in other restaurants, they are given special prices as well. In India the voting age is 18 but the young adults under 21- 25 (depending on the states) may not be served wine or any alcohol in most states except Goa, Karnataka, Kolkata and Tamilnadu where the legal age coincides with the voting age. Now the age is proposed to be increased from 21 to 25 in Maharashtra but in La Barrique, one of the three single-Michelin Star restaurants in Torino, the young adults are welcomed with special prices for dinner with wine. Ristorante La Barrique, owned and run by the 50- year old Torino-born Chef Stefano Gallo, was opened in 1999 in not a particularly good location but it is popular because of its delicious food and professional service with friendly Chef Stefano and his wife adding to the charm by being very approachable. 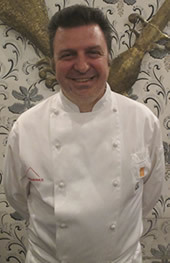 The Ristorante received the Michelin Star in 2004 and has been getting one regularly. The Tradition five-course Degustation Menu costs a mere € 70 without wine; you pay additionally € 25 if the wine is added. The Seven-course gourmet menu costs € 85, adding € 30 for wines, making it a great value-for money meal. Moreover, in keeping with the Italian gourmet tradition, ‘Young people with four-course menu with wine pairing of two € 50.00 Dedicato ai giovani al di sotto dei 25 anni Dedicated to young people under the age of 25’, according to the menu. This means the young adults under 25 pay almost half the price though with the right amount of two glasses with the four-course Menu. 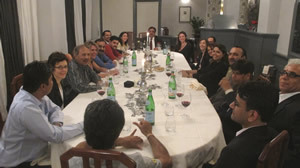 The dinner hosted by the Piemonte Agency in conjunction with the Italian Trade Commission for the visiting importers of food and wine and the journalists from India had an impressive start with Pomodoro in diverse forme e consistenze, Asparagi, parmigiano reggiano, a combo of Tomatoes of various sizes and shapes accompanied by Asparagus and the Parmiggiano Reggiano. It was a perfect combination with Arneis di Cascina from Chicco, produced by the aromatic and fruity Piemonte grape which has gained popularity during the last 20 years and is getting increasingly popular. It is already available in India at most Italian and Mediterranean restaurants and in retail. The Primo Piatto-Riso mantecato alle punte di ortica e crema di robiola di Roccaverano started an interesting debate on the table whether it was a Rice dish or a Risotto but with soft ripened cheese and the Nettle tips that made the green colour dish very refreshing in appearance and the aromatic, the al dente dish was a perfect match for Risotto, as the Italians on the table conceded it could be referred to. Interestingly, it went well with both the white and red wines, though I preferred mine with Arneis due to the summery mood. Verdure alla griglia e formaggi del territorio, a grilled vegetable dish including zucchini and aubergines may not have been very exciting for the vegetarians but the favourite Piemonte vegetarian dish paired well with the Nebbiolo di Cascina Chicco made from the typical red grape Nebbiolo of Piemonte. The main dish (Secondo Piatto) The Maialino da latte brasato in lenta cottura, crema di patate e ortaggi di stagione-the braised pork spread on a bed of mashed potato and made from ‘baby pig’ – a popular Italian Main Dish with seasonal garnishes like green beans, was the heart of the Menu. It was so tender that one needed no knife to slice through it-the creamed potatoes gave it the right texture balance on the palate, the flavourful meat melting in the mouth. The Star earned by Chef Gallo was clearly visible in this dish. It was not surprising that a normally non-red meat lover like me simply relished the dish. It was a bonus that the Nebbiolo from Cascina Chicco, a winery in Roero in the town of Canale was a perfect match, with the tannins in the wine offsetting the proteins of the meat. Although the organizers had settled for a special fixed Menu with the two wines, it was an eno-gastronomical experience that any young Italian adult would relish as a special treat. In Italy where 16 years is when one normally starts drinking wine, the restaurant offers an introduction to fine dining for young adults. This is just one example of fine dining. Italy is full of thousands of restaurants with casual find dining where wine is a part of the meal. To deny the youth who are as the cliché goes, old enough to vote but too young to drink, would be unfair. The same choice ought to be available to them once they are adults. They need not be, nust not be forced or obliged to drink wine or alcohol at 18, 21 or any age unless they really want to. The government should in fact reduce the drinking age for beer and wine to a uniform 21 and eventually bring it down to 18 years. It is indeed a regressive step incongruent with the progressive India and the youth of Maharashtra should protest strongly. It is really impinging on their liberty and snatching their right away of choosing if they want to drink or not. The state governments should focus on reducing the consumption of gutka and other carcinogenic compounds that are directly responsible for the harmful effects on health instead. For checking out the legal age in India and the rest of the world, visit IBN Live. There is a minor error in the age for Delhi which has been incorrectly described as 21 while it is actually 25 (unless they have had a peak in the new excise policy which continues to be awaited and is overdue by 3 months already and was reported earlier in delWine).